announced plans to launch a similar program at 80 publications, saying it could boost earnings by $100 million in 2013. After the first month, the price goes up to $3.99 per week, which seems a wee bit steep to me. The New York Times charges me $2.60 per week and the Wall Street Journal charges me $3.99 per week, and meaning no offense, those are much better papers with far more content. It doesn’t really matter to me, of course, since I already subscribe to the print edition, but I have my doubts that there are thousands of new subscribers itching to pay that kind of money for the LAT. As it happens, the trend toward paywalls is a particular problem for me, since I’m a blogger and rely on access to lots of news sources on a regular basis. 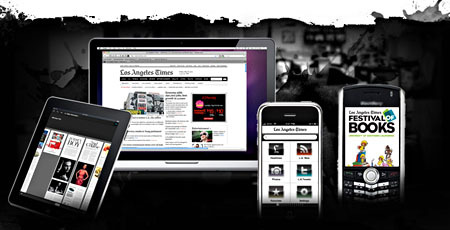 But I already subscribe to the Times and the Journal, since they provide content that’s genuinely unique/valuable, and also to the LA Times, mostly out of habit and residual loyalty. But that’s about all I can afford. I’d like to read the Financial Times more regularly too, but $700 per year in newspaper subscriptions has me tapped out. As other papers start erecting paywalls, it’s going to make my job ever harder. At the same time, although I think the LA Times is overpriced, I don’t really blame them or anyone else for putting up a paywall. The conventional wisdom among the digerati, as near as I can tell, is that paywalls are always and forever bad things, but why is that? I’d say just the opposite: I’ve never entirely understood why most newspapers offer online editions at all. I’ve heard dozens of strained arguments about how online editions don’t cannibalize sales of the paper edition, but come on. Of course they do. There’s always been a strong whiff of special pleading to these arguments: we don’t want to pay for news, therefore it must be bad to charge for news. Online editions are good PR! They draw in new readers! Etc. We heard the same arguments for years in the music biz, and guess what? Online piracy/sales cannibalized the hell out of existing channels. The same thing is almost certainly true of newspapers, and as the digital generation grows up cannibalization will increase. But what do do? Even after more than a decade of dotcom experience, online advertising still doesn’t cover the cost of producing your average metro daily. Not even close. I’m not sure online advertising even covers the marginal cost of running a website. So you either charge or die. Of course, “die” is going to be the choice for a lot of news outlets. Most of them do a crappy job of reporting national and international news, and sports and gossip are available from a million places. That leaves purely local news, which is a pretty tiny niche. But they might as well try. It’s not like there’s some cosmic law that says news outlets are required to give away their products for free. The advertising model isn’t working, and maybe no other model will either, but they might as well start experimenting. It’s either that or give up.